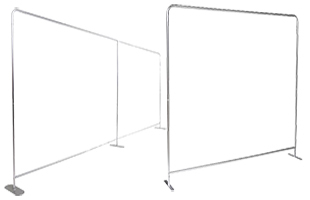 The borders within any exhibit are an important aspect of the overall atmosphere in a space. 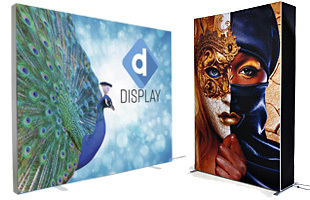 Our trade show booth backdrop walls consist of commanding backgrounds, colorful sidewalls, and banner stands. Our large catalog of convention frameworks has something for everyone. From neutral pieces to fixtures with custom graphics, our booth backdrop walls will turn your space into a more visually appealing exhibit. Each unit is portable, making it simple for transportation from place to place. Booth backdrop walls come with all the necessary hardware for easy assembly — some require no tools at all! Browse our catalog of display fixtures to find one best suited for your business. What types of exhibit backgrounds are available to me? 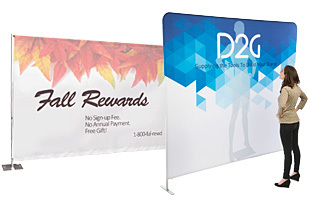 Trade show booth backdrop walls with stretch-fabric are available in a variety of styles including banner stands, pop-ups, and curved units. 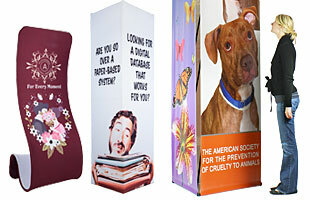 These pieces are customizable with the artwork of your choice to promote and enhance your business. Each fabric background is printed using our dye-sublimation method — giving it a vivid finish. Vinyl displays with custom graphics feature high-quality panes covered with a laminate coating. These are printed with a lifelike 1200 DPI resolution for a rich color and clarity. This design helps them withstand the wear-and-tear of convention use. 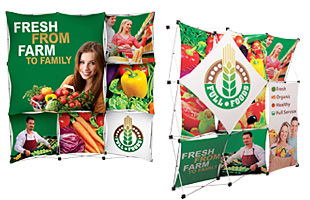 These large displays will help create a strong presentation to potential visitors. 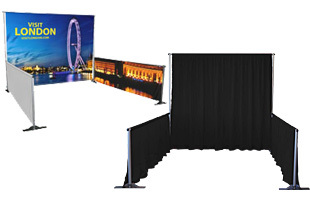 Black pipe-and-drape frameworks and sidewalls create a dramatic presentation without breaking the bank. This curtain-style fixture is easy to maintain and is made from high-quality polyester that can be reused at conventions year after year. 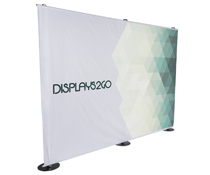 Pop-up displays are the epitome of portability with their unique frame shape or knock-down design. Whether these backgrounds contain pipe-and-drape posts or expandable frames to create a 3-D effect, each piece is easy to put together. Each unit can be personalized with custom graphics and artwork to fit your brand message — both straight and curved designs are available. 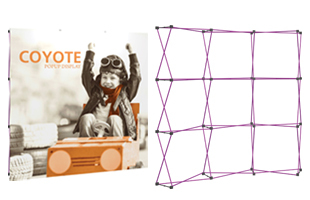 Backgrounds with hook-and-loop receptive material are a versatile solution to making a display your own. Using this fabric, exhibitors can easily attach custom graphics, samples and descriptions of merchandise, and other promotional materials. 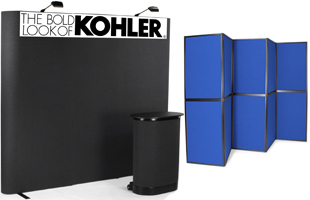 These come in three different designs: folding panel, straight pop-ups, and curved units. Truss style fixtures are an easy way to create a commanding presence at a convention. These modular systems can be the focal point of your whole exhibit or used more modestly as a background with custom graphics. The units are built using smaller cube modules that attach together with an “x” connector to create the all-in-one system. If you have an outdoor exhibit, our tents can be customized to promote your brand and will be an eye-catching piece of your presentation. 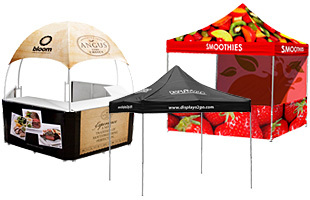 Standard portable canopies or pop-up kiosks with counter space are available on our site. Regardless of what type of background you choose, any piece will enhance your presentation. 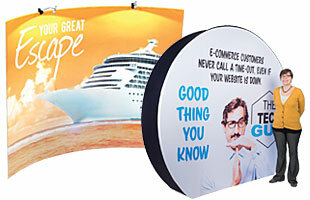 There is no better way to promote your business than with customized backdrops. Browse through our large catalog of display fixtures to find your perfect match. 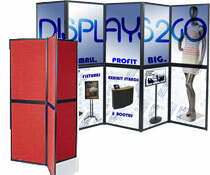 Exhibitors should have peace of mind because our units will fit within standard trade show regulations. 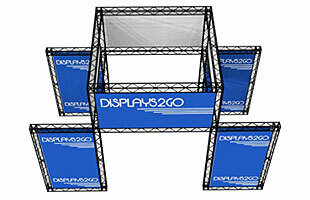 At Displays2go, we take pride in providing our customers with quick shipping and low prices. Let us earn your trust today!